In the past when someone mentioned getting married, Du Lei Si (Durex) would feel fearful enough to flee. What is so good about getting married? Organizing a wedding ceremony is akin to spending money like running water. After giving birth, you must also raise the child. If you don’t maintain yourself well, you will get out of shape. As a result, maybe a vixen will grab your husband and take your baby away. Not getting married! Definitely not getting married! However, fate is like this. Whatever you are afraid of, unfortunately, it will be given to you. This, isn’t this like some drama? After pondering over it, I decided that this surely must be a stunt from some television station’s new program. Invite a celebrity to pretend to be a passer-by who proposes marriage. This year, with the economic crisis, being a producer is not easy. Thus, out of kindness, I accepted the diamond ring. Only to find out that all of this was actually real! The diamond ring is really and truly a genuine diamond from South Africa. Moreover, the groom is also a genuine rich man! Actually, wasn’t this just like the legend of marrying into a rich and powerful family? I always feel that in front there is the belly black President who is like a ruthless wolf watching me attentively, and if I am not careful, he will tear me apart and swallow me into his belly. Whereas behind there is the crowd who do not know the truth, standing in a circle and watching as the drama unfolds. I still have not explained clearly but Mrs. President’s fame has already spread quickly from mouth to mouth. This time, Du Lei Si really feels regret. Who can tell me, can I not marry ah? This story doesn’t exactly have the best start, since the whole marriage contract scenario was very forced, however it improves a few chapters in. The setup is very typical – naive and somewhat slow female lead forced to interact with a high spec male lead due to various circumstances as they fall for each other. Neither of the characters are particularly outstanding or distinctive (the most interesting thing about the female lead is her name... but that gets old fast and that she’s at the receiving end of the male... more>> lead’s jokes and snarks), while their relationship progress is standard. The premise isn't anything new but the stand out thing about this story is the dry humour. This story doesn't take itself seriously so you shouldn't too! This brand of humour may not be for everyone, but I love it. I feel that the author and I can get along well if we know each other irl hah. To get the premise out of the way, gullible naive FL was tricked by ML and wedded to him in lightning speed fashion within the first few chapters. Now on to the fun... more>> part, with her name being Du Lei Si (Durex), it's obvious the FL is about as classy as her name is. Whereas the ML being the more 'outstanding' species of the two always gets the upper hand. The nature of their relationship is akin to a lamb being served up to the wolf. 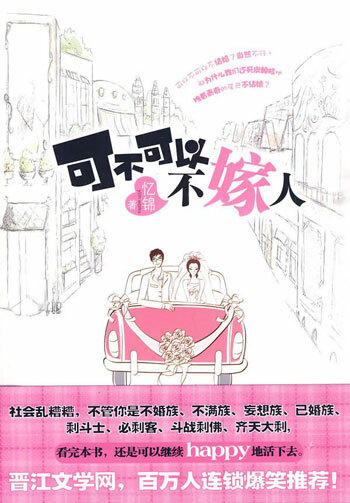 The story is largely presented through the eyes of the FL as she hilariously tries to adapt to high society and her marriage life, frequently seeking advice from Baidu (China's Google). Some might feel that the couple's relationship went from 0 to 100 abruptly. That may be so for a marriage of convenience like theirs, however do bear in mind we are reading from FL's POV and she is pretty ditzy and very slow to pick up on ML's infatuation for her. The last 1/3 of the story is exceptionally sweet! The ML dotes on the FL a lot! Quite a number of Chinese idoms and phrases were translated in a very literal manner without explanations. I'm Chinese so I am able to understand them. However non-mandarin speaking friends may be slightly confused, though it won't affect the overall comprehension of the story. After reading several Chinese novels that have romance in them, I understand that perfect, domineering male lead who is occasionally doting + female lead who is easily short-circuited by whatever the male lead does to them (a smile, a whisper, a blow to the ear, and in our MC's case, a simple stare or a kiss), is one of the trends. However, seeing MC who has a strong, interesting personality, being led around by the nose (with the exception of few rare moments) and slowly submits herself to 'capitalism' is... more>> simply unpleasant. Even she herself is aware of it. Also, the ambiguous feeling that hangs between the two leads drags on the romance. It can be very vexing if you hate seeing the lead characters dancing around the bush and don't know what they want or how to express their feelings straight out, especially MC. For me it's a rather unbelievable for a 26-year-old woman with romantic experience to act the way she does. I'm the kind of person who drops a novel even if a small element feels wrong. I have rated this novel 5 because no matter how many times I've put it back because I got bored and almost dropped it, it revived my interest once again which is a very rare occurrence. For one I like the consistency of this novel, the personality of the characters are consistent till the end--yes even the male lead. I knew from the very beginning that he had a fishy personality. The female lead... more>> is a simpleton but amazingly I actually like her. Her airheadedness is likeable and not annoying like other characters (maybe because this is a Chinese novel (??)). I really found her funny and the male lead is not an arrogant prick that you would wonder why the girl falls for him. Not to mention the romantic and 'teasing' scenes really came across well---I felt the romantic tingles. I suffered from a lot of second-hand embarrassment from this novel. Ah Dudu really. Many of the themes aren't concluded at all and are left hanging in the air. But it was a pleasant read nonetheless because I was in the mood for something lighthearted. I can't say that personally like the series enough to continue, but it's well written story that capture some of aspects of falling in love while being married. Unfortunately, the character personality traits while being multidimensional are almost stock characters. The formula for this story is equivalent a Cinderella story about what happens after marriage. So we have the typical love story with the stoic and aggressive (okay... usually they are charming or gentle) male lead with low social experience, and skill that is lured into finding a partner... more>> for marriage who happens to be poor foolish not naive female character.